Luxor is a fascinating city on the banks of the Nile. It is positively littered with ancient ruins, a fascinating place, whether or not you have an interest in Egyptian history. It was built on the ancient capital Thebes and as well as temples it is also home to the famous Valley of the Kings. 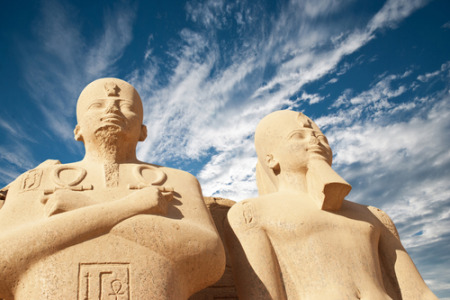 Step back in time on a trip to Luxor. Luxor holidays appeal to couples of all ages and are often taken during the winter months when it is less hot, and when conditions are more comfortable for sightseeing. And visitors to Luxor , without exception, are sightseers. The tombs of the pharaohs are found in the Valley of the Kings on the west bank of the Nile. Most of the tombs are not open to the public as work is ongoing. Visitors must pass through the tombs in single file and photography is forbidden. Surrounded by the modern city on the east side of the Nile is the imposing Karnak Temple, the largest in the world. It is an amazing sight by day but absolutely stunning at night when there is a sound and light show. The city has several museums, the most popular and the most gruesome, as well as the most fascinating is the Mummification Museum. Sail down the River Nile. While on your cheap Luxor holiday, take a felucca and sail up the Nile when the sun is setting. You see the city from an entirely new perspective highlighted by the dramatic colours of the evening sun. If you fancy a further perspective, take an early morning balloon flight and watch the sun rise over the Valleys of the Kings and the Queens. A truly spectacular experience. Luxor holidays offer high standards of accommodation and service. It is a lively, restless city with restaurants catering for all. Those who enjoy shopping will be delighted by the range of retail opportunities from boutiques to market stalls. Do remember that haggling is expected or you will pay over the odds for your goods. If you are interested in a cheap Luxor holiday, but you find the task of trawling through web page after web page attempting to find the best deal daunting, try our simple search facility. You'll find over three dozen travel companies competing for your custom. It is simple to use and remember, competition brings out the best bargains. Our search facility enables you to see at a glance, the Luxor holiday that is the cheapest, and the one that offers the best value for money. All you have to do to secure the holiday is make a phone call. To book the best deal, and to avoid disappointment, ring today.